Lots of birthday party ideas! Ntando Duma’s daughter Sbahle Mzizi recently celebrated her first birthday in a star-studded pink themed party. 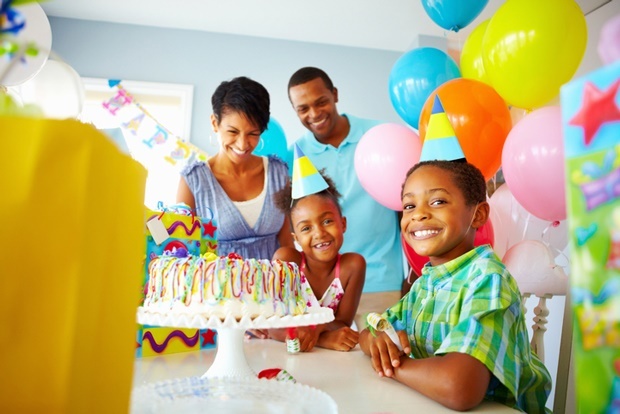 Go big while keeping your carbon footprint small – why you should be hosting eco-friendly birthday parties for your kids. Chris and Nia decided to put their differences aside and throw one unified birthday bash for their only daughter. Designing a magical forest-fairy party for your little girl is easier than you think. There really is no party like a celeb kids’ party! Hay bales and tiny milk bottles - check out this farmyard fun party! Check out these basic and easy tips for the perfect farmyard fun party theme. Not sure what party to throw for your child? Try hosting an outdoor screening of the birthday girl or boy's favourite movie! WATCH: How to make unicorn cupcakes! Kids love birthday parties and they absolutely love unicorns. So we thought we'd combine the two and make a video to show you how to make the perfect unicorn cupcakes! Our space party is out of this world! The circus is in town with this party theme! Roll up! Roll up! The circus is in town! This fun theme is perfect for both boys and girls. With this theme you can go wild with colour, costumes and decor. Check out some of our ideas for the perfect circus party. Keep your child's first birthday simple with this precious polka dot party theme. Be the talk of the town with a fashionable robot party. Do your kids love arts and crafts? Now you can throw them an arty crafty birthday party! Get creative with an arty theme. Carried through to the food and décor, here are some cool ideas! WATCH: How to make frilly fondant flowers fit for a princess party! We put together a video to show you how easy it can be to make gorgeous cake decorations using fondant. Watch us make roses, daisies and carnations for the perfect floral-themed cupcakes! WATCH: How to make delicious caramel and banana pancakes, with sprinkles! Looking for the perfect soft and sweet pancake recipe for a birthday party or rainy day? Never mind. Who are we kidding? You don't need a special occasion to whip up some gorgeous pancakes. Check out our recipe. WATCH #ParentingHacks: How to make decadent monster mousse! Make these delicious chocolate mousse cups with this 3-ingredient recipe, and top it off with the simplest and easiest ghostly decoration for the perfect Halloween-themed birthday bash! WATCH #ParentingHacks: How to make Oreo Pops! A quick video on how to make Oreo pops: the perfect treat for a themed birthday party. The Breakwomb moms put together this hilarious video on exactly what caffeine does to and for us when it comes to planning a party, and we just can’t stop laughing. Your hassle free guide to the perfect birthday celebration. Super cute ideas for putting together a memorable PAW Patrol party for your little one.